On Friday 7th and Saturday 8th July, Wynyard Hall played host to another brilliant festival in their beautiful gardens. This time, celebrating the wonder that is gin. 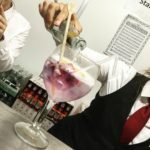 With over 55 different variations of gin, and an array of flavoured tonics to compliment and a free balloon glass to take home, it really did pay homage to the versatile and popular spirit. 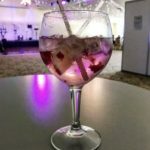 The huge marquee was set up with around 10 different stalls, all of which had a selection of four or five different gins. You were given your balloon glass, engraved with ‘The Wynyard Hall Gin Experience’, on arrival as well as a brochure that detailed each gin available, its origin and the ingredients. Although the brochure was a nice touch, it was much better to talk to the staff members manning the stands. 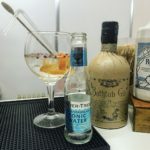 They had clearly been given a great deal of information prior to the event and were happy to tell you all they could about each gin, the tonics and garnishes it worked best with. I’m partial to a much more botanical tasting gin, rather than sweet or fruity, and each stall was capable of letting me know which they think would be most appropriate for my preference. The amount of gins made for a hard decision as you circled the stalls several times trying to decide on which stand you should chose to use your tokens. A token for a single gin was £5, a double gin token was £8 and if you fancied a cocktail or two, these tokens were available for £7. 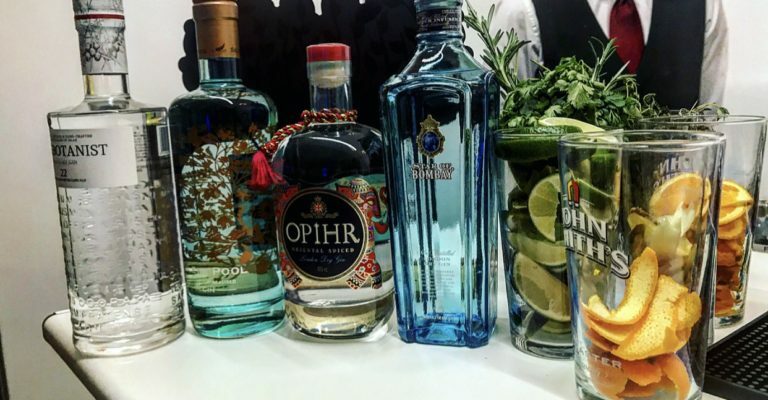 Whilst it sounds like an expensive night on the tiles, it was more about experiencing the gin, discovering new tastes, brands and mixes. As well as gin and cocktails, the main bar was open for all other kinds of refreshments. There was musical entertainment and plenty of seating areas set up for you to enjoy the gin, the band and the company of your friends! Outside the gardens were a selection of street food stalls including Korean street food, gourmet burgers and more. 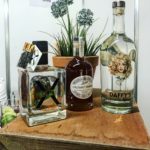 Whilst some of my favourite gin producers were showcasing, such as Edinburgh Gin, Sipsmith and Hepple Gin, I wanted to try new little numbers that I’d never came across before. My two favourites of the evening was the Sharish Blue Magic Gin and the Bathtub Gin. Sharish Blue Magic is a colour changing gin. Yep, colour changing. In the bottle it’s a beautiful bright blue but once you add your tonic, the spirit slowly transforms into a lovely light pink colour. I initially chose this because of the novelty of it, but it was actually incredibly nice. A Portuguese gin that used juniper, coriander, angelica root, ginger, cinnamon, cardamom, lemon peel, strawberry and raspberry. It was slightly sweeter than my usual choices, but it was teamed well with a slimline tonic, raspberries and slice of lemon. The Bathtub Gin was most definitely my number one choice of the evening. A Moroccan inspired gin created using botanicals such as juniper, coriander, cardamom, cinnamon and clove that are all infused in top quality copper pot-still. It was recommended to pair with Fever Tree Mediterranean tonic water, orange peel and pink peppercorns. It had a warm, citrus taste but still released a fragrant, almost outdoorsy element that was teamed perfectly with the peppercorns. Apparently, both of these gins are only available online. But if you fancy trying something new, I’d definitely recommend making the purchase and experiencing something a little bit unusual. 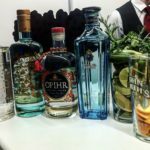 The Gin Festival was a truly great evening, I discovered new favourites and spoke to some incredibly intriguing gin connoisseurs. Certainly not the usual way I tackle my gin on a Friday evening, but it was something different that I hope grows bigger and better in future years. I’ll most definitely be returning. Cheers! See more of Laura’s photos from the event below.